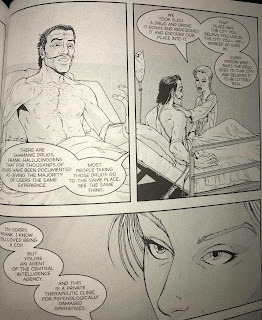 I am a huge fan of Warren Ellis, and have a soft-spot for the period of time he made comics for Avatar Press. 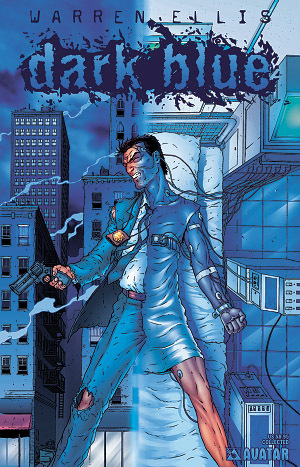 They were comics that could vary immensely in quality, but always had some damn good ideas (and the best ones, like, "Doktor Sleepless," are among my favorite works of his). One story he did with artist Jacen Burrows was titled, "Dark Blue." It appeared in short installments within the now-gone Avatar Press anthology, "Threshold," which often featured an assortment of creative, violent, or outright pornographic short-strips (now Avatar Press uses imprint Boundless for all their racier works). 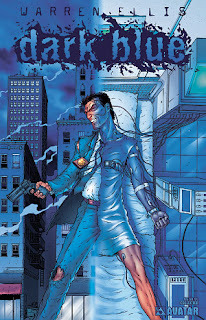 "Dark Blue," was then collected in a trade paperback, which is how I first read it back in the early 2000's. It stuck with me all this time, so clearly it did something right. "Dark Blue," follows police detective Frank Christchurch. He lives a city within a world that just doesn't feel right. Over time things have been getting worse, with the safety of the city falling into shambles, the police force having its morals or sense of right-and-wrong disintegrating, and Frank himself starting to feel like he has a looser and looser grip on reality. Meanwhile, a serial killer named Trent Wayman is racking-up a huge body-count and leaving behind scenes too gruesome to stomach, yet everyone seems content to leave him be. Something is wrong with the world...and that's because as is repeatedly hinted throughout the earlier parts and revealed in the final third of the book, the world isn't real. Frank isn't a cop. He was a a CIA agent who suffered a mental breakdown on a traumatic assignment and to help him recover he was enrolled in an experimental program. The CIA knew of a drug that induced shared hallucinations among users, chemically altered it, and was able to create a, "Narcospace," where people put-under on the drug all live within the same imagined city. Hundreds of folk who for some reason need to be knocked-out and allowed to repair their minds (or doctors monitoring the city by using the drug too) are, "Living," in this space. Frank is told this when he wakes-up out of some months-long time in Nacrospace how he was simply a resident...like Trent Wayman. Yes, Trent Wayman was one of these people, but he was accidentally given too much of the drug before it was fully understood, he was administered LD50, the dosage at which 50% of the people given a drug die. He's still in there though, existing in the city as some sort of ghost that nobody can stop or even fully comprehend, making things worse through his madness everyday. Frank demands to go back, on the LD50 dose that will allow him the same powers in the Narcrospace as Wayman, even if it means he'll die. Frank finally stops Wayman, and the fictional world he values is saved as he too appears to pass-away, but with no regrets. All this occurs in a relatively short story of about 72 pages, with Ellis clearly working a lot into a short span of time. We've got a brutal and dark police story about corruption, a psychological thriller of a man not sure if he's going crazy, and a wild sci-fi concept rooted in some fact (in the afterword to the story Ellis writes about the drug DMT which is known to elicit the same, "Trip," in many users). It's an odd mixture of genres, but because Ellis is a masterful writer he makes it all work. Plus, considering how talented Burrows is, you know the art is amazing and brutal at the same time. "Dark Blue," is for sure what one would call a, "Deep-cut," when it comes to Warren Ellis' many creations, but it is without a doubt a read worth seeking-out.